If the 2019 Jeep® Cherokee has you stopped dead in your tracks with its sleek redesign and off-road capability, then you’re not the only one. 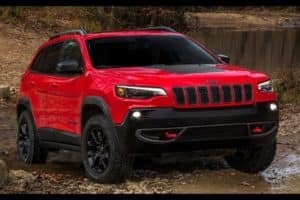 At Landers Dodge Chrysler Jeep RAM, this new Jeep model has Bossier City, LA drivers test driving this compact SUV that knows how to tackle pavement and uncharted territory. Whether off the grid or on it, the latest Jeep Cherokee is a great ride and is available at our Bossier City Jeep dealership. Although we believe the 2019 Jeep Cherokee looks best with you in the driver’s seat, you’re more than welcome to test it out for yourself! It may get complicated when choosing between six trims – all of which offer a ton of features. A 2.4-liter four-cylinder engine rated at 180 horsepower and 171 lbs.-ft. of torque comes standard. Yet, if you crave for more oomph, our Jeep dealership near Shreveport, LA have you covered with more powerful engine alternatives. Tow up to 4,500 pounds with the 271-horsepower V6 engine, or if you’re in it for the off-road game, direct your attention to the Trailhawk® model that was designed for the road less traveled. From its premium cabin to its user-friendly infotainment system, the new Jeep Cherokee is a trophy you’ll be glad you took home. If finding a safe car is your number one priority, then the 2019 Jeep Cherokee won’t disappoint. This model comes with the latest technology features. And don’t forget about the model’s automatic emergency braking, rear cross traffic alert, and rain-sensing wipers. All of these safety features are available on the 2019 Jeep Cherokee. What has really gotten people excited is the standard 7-inch screen display with Android Auto™ and Apple CarPlay™ capabilities that now comes standard on the Jeep Cherokee. This vehicle also offers plenty of comfort and style, with available premium leather upholstery and sunroof. If the 2019 Jeep Cherokee has you on the edge of your seat, head to 2701 Benton Road in Bossier City, LA. Also stop in to our friendly Jeep finance center and ask about how you can take home this new Jeep vehicle. We offer plenty of ways to finance!